Exotic Sulawesi and the traps within! In our recent trip to Southern Sulawesi, we managed to cover several hot spots which are favourite tourists haunts. If you look at the map of Sulawesi, you would agree that it has the shape of a two legged being with a long slender nozle like structure. Makassar, the capital city is situated in the right leg on the west coast. A port city, it is big and densely populated, with bustling business all over. All its old streets are lined with shops and in newer sections, modern malls pave the city that was once colonized by Holland. Many colonial structures are preserved and made into tourist attractions like Fort Rotterdam. Tanjung Bira was one of our destination and as it was situated far out in the east coast, we decided to go there the very next day after arrival. A journey that was postulated to take 4 hours ended a total of 9 hours , as we had to endure an hour of rough bad road under repair along a disrict called Jeneponto. To be fair, we had made several stops for lunch, prayer and a visit to a village, famous for their fine wooden sail boats industry. Furthermore, there are no highways there and the roads are narrow, which make it difficult to overtake and thus they could only drive at 70 km per hour the most! Starting in the morning, we arrived at Tanjung Bira in the evening, just as the sun was setting in. As we checked in at the initial resort, we managed to savour the beautiful hue of the sun setting sky across the sea horizon. Truly breath taking. Unfortunately, the first resort we got in was dimly lighted and dark plus eirie in certain areas of its ground, with no other guests occupying it, sending chills down my spine. Uneasy, I half prayed that we could change to a better place. I was secretly overjoyed when the air cons didnt work well which forced us to change hotels, despite having to pay 25% of the charges for the hardly an hour stay. Tanjung Bira boasts of picturesque white beach with crystal clear water which appears turquoise from afar. The sand is fine almost like flour in texture. You can swim, ride on bananas, walk on the soft sand or simply absorb the whole exhilirating landscape by standing on higher grounds of the cape. Or you can ride a speed boat to a nearby island , stopping midway to snorkel and ogle at the colorful corals and fish. Or swim by holding onto to turtle backs which live in an enclosed area near a kelong. As Kajang is near to Tanjung Bira and is the home of an old tribe there called Ammatoa, we decided to pay a visit. Again, due to bad narrow roads, the 60 km ride took 2 hours. Exhausted, the phrase " are we there yet?" kept on playing in my head. Ammatoa tribe is famous for their strict way of life of wanting to be in constant sync with the earth. Thus they advocate their members to wear black and live a laid back life with pure basic emnities, no electrical appliances whatsoever. As we reached the outer skirt of the village, a guy approached our driver and impressed upon us that we needed him as a guide to go in which has to be on foot. After sizing us up, he demanded we pay him 300,000 rp, with additional 100,000 rp , rental for black garments which he said was compulsory. He even asked our intention of going in and made it sound as though the Ammatoans are actually aliens who might do us harm. Needless to say, I was very apprehensive of the whole visit! Next we stopped at rumah Pak Desa, whom We assumed to be the tribal head. Only one of us was allowed to go in the house with the guide. And please hide your cameras, for whatever reasons but now we know it was just a scare tactic. We waited anxiously as my husband went up the traditional house. After what seemed a long 5 or 10 minutes, they appeared with black garments and handed them to us girls. Apparently, there were no size for my husband and son. What? You mean its ok not to wear them after all? Poor Sarah and I had to don the black satin gowns in the scorching heat! Even though I was already sceptical of the self elect guide, I was still apprehensive and wore the black gowns, just in case. Strangely but fortunately, the garments smelled fresh from the tailor with no residual body odor. And oh by the way, Pak Desa was not in. By then I was suspicious of who this Pak Desa really was. As we ambled through the calm grounds of the old village, we were expecting tribal members wearing black from head to toe to come and greet us. Alas, every one was busy with their daily chore of drying paddy in the sun or leading horses with loads on their backs. And guess what?? Hardly anyone was wearing black attires! They were wearing t shirts with sarongs! Only one or two were wearing black and even that didnt qualify as my mental version of the Ammatoa!! After realising that this was all a masquerade, I removed the black gown and held it on my arms. The guide swiftly offered to hold it for me! After all, the gown will ensure another 25,000 rp from the next poor guest. By the way, despite not having any black gowns to fit my husband and son, we still had to pay for them! Sheesh! By this time, my daughter and I was laughing silly at ourselves. We joked that the only true Ammatoans were only the both of us! We actually came all the way to see ourselves all dressed in black! After showing us how they made their own clothings by dyeing weaving material black, using leaves of a plant and soaking them for days, we became weary and bored and dissapointed. Realizing this, he quickly suggested we go see a waterfall nearby. When asked how far? He said just 300 meters away. Which was actually downhill along a fairly difficult trek. And the waterfall was ok but we would have passed it if we knew that we had to climb up back a more treacherous path!! By this time, I was so pissed off with him, as I gasped for air as I climbed. I was telling myself that I would write a review on this place to prevent people from being duped by this whole thing! The cats of my house have now entered a new phase. Prior to this, at any time, my house would harbor at least 5 to 6 of these feline creatures, if not more. Most recent, to be more exact, right before we balik kampong for raya, there was Mocot, (Mayo's ( the early martriach) second generation descendant), MB, Gum and 3 frightful kittens. Thanks to Mocot's overprotective behaviour i.e. hiding her newly borns in secret hideaway till they get so mortified when faced with strangers, these scadycats would scurry off like mad when they hear our footsteps. So before raya, there were 6 of them. When we came back after our raya break, only Mocot and Kitam ( one of Mocot's male offspring who left home as he can't cope with the pressure from the intimidating male cats next door) greeted us. Initially we were baffled as to why there were no show from the rest of the clan and thought they probably migrated for better pastures which was very unlikely. And we would hear frequent cat fights but shrugged it off as something normal. One day, as Mocot and Kitam were munching on their biscuits, we saw one of the kittens came approaching, most probably for the biscuits and it looked rather thin. My guess is that it hasn't had proper meals for days. The minute it saw the two big cats, it slowed it's pace and appeared rather apprehensive. The next thing, we saw Kitam with all his might chased it away. Not just that, he even put up a fight with it making such a clamour. Now we know why the other cats have not been around lately and if we ever did see them, it would be outside the house compound, in the neighbor's or sheltering under parked cars outside. So Kitam has made a permanent come back and decide that he is going to rule the place alone with Mocot. Funny though, Mocot seems to condone this unscrupulous act of his. After all, these are her offsprings that he is chasing off. His close relatives too, for that matter! Worse still he is making Mocot, his new mate! For goodness sake, she is his mother! One morning, as Sofi was about to hang clothes, the once unfriendly kittens came making relentless mewing sound, asking for food. At the same time, they appeared absolutely terrified and ready to jump out of their skin. They gobbled up the biscuits ferociously and would constantly look behind them, as if Kitam was about to pounce on them any moment. It was a truly pityful sight, watching their jittery souls braving the situation, torn between hunger and total fright! However, their pleasure was cut short as they saw Kitam and Mocot came marching in. Sofi described the scenario succinctly: Kitam and Mocot came walking stoutly, shoulders up high with sharp leering eyes ala Mafia gangsters roaming the streets. The minute the kittens saw them, they ran for their lives, leaving behind their unfinished meal! In the afternoon, both Kitam and Mocot would lay sprawled on the porch, as if guarding their territory, looking out for any lurking kittens. So, statistically, we are now left with only 2 cats, as long as Kitam continues with his determined territorial behavior and Mocot does not get pregnant again for the umpteenth time! tidak silap Ketua Helwa yang pertama, yang juga di antara pengasas ABIMHELWA. Pemergian Allahyarhamah K Jah (nama gelaran beliau di kalangan Helwa ABIM) memang diratapi oleh seluruh warga ABIM, baik wanita mahupun lelaki. Sepanjang hari-hari terakhir beliau yang dirawat di HUKM, pelawat tidak putus-putus mengunjungi beliau. Ketabahan beliau menghadapi saat terakhir itu sukar dilupakan. K Jah seperti biasa amat bersemangat dan mentally alert. Dia kenal dan tahu siapa pelawatnya dan dalam keadaan yang sakit, masih ingin berbicara dengan senyuman manisnya yang menjadi trademarknya. Melihat beliau ketika itu sukar untuk percaya beliau sedang menanti saat-saat terakhir. Saya mengenali K Jah kali pertama di Kolej Tunku Kurshiah Seremban. Beliau datang ke Kolej untuk memberi ceramah motivasi atas undangan Murid Tua (inilah istilah lama untuk alumni). Beliau diperkenalkan sebagai wanita Melayu pertama meraih ijazah sarjana muda bidang fizik. Memang K Jah seorang yang boleh menaikkan semangat pendengarnya. Sejak itu jiwa saya turut berkobar-kobar mahu meneladaninya. Menjadi perintis Melayu dalam apa jua bidang yang mungkin semata-mata ingin membuktikan orang Melayu juga mampu. Dan akhirnya saya ke Amerika Syarikat untuk mendalami bidang matematik yang ketika itu memang kurang diceburi oleh anak Melayu malahan dicemuh bahawa bangsa Melayu lemah matematik dan sains. Begitulah kesan K Jah pada diri saya ketika itu yang masih di bangku sekolah menengah. Saya pernah bertemu K Jah di University of California Davis ketika beliau meneruskan pengajiannya di peringkat tertinggi. Dan ditakdirkan Allah, kami bertemu lagi dalam jemaah yang kita kasihi iaitu ABIM - saya masih bertatih mengikut jejak langkahnya. Alhamdulillah, kami terus bersama dan jurang adik dan kakak semakin tipis - sama-sama selaku ahli profesional Muslim yang ingin memajukan umat Islam menerusi da'wah dan juga bidang keilmuan. K Jah seorang pejuang profesional yang amat passionate dalam apa sahaja yang beliau lakukan. Beliau amat passionate dengan ABIM, ilmu dan pendidikan. Beliau tidak akan menolak sebarang undangan Helwa mahu pun Biro Pendidikan ABIM dalam aspek pengongsian ilmu khususnya cinta pertamanya - sains Islam. Di akhir fasa perjuangannya, Allahyarhamah amat prihatin tentang keperluan memasyarakatkan sains di kalangan orang Melayu dan pentingnya hubungan sains dan aqidah. Sains sebagai ayat-ayat Allah swt. Walaupun sudah didiagnos dengan kanser, selagi beliau boleh berdiri, bercakap dan kuat, beliau masih meneruskan perjuangannya - hatta ke Indonesia - berbicara tentang sains Islam sebagai memenuhi undangan IIIT Indonesia. Beliau masih menghadiri majlis Helwa di awal tahun 2011 walaupun kekuatannya sudah mula merosot. Usaha K Jah bukan sahaja untuk ABIM malahan semua organisasi Islam seperti Yadim dan IKIM. Kegigihannya dalam bidang sains terbukti bila K Jah dilantik sebagai felo oleh Akademi Sains Malaysia. Beliau tidak lupa mengundang saya pada hari bersejarah perlantikannya itu yang beliau gunakan untuk membentangkan mesej cinta pertamanya. Tk dear all. Help baca Yassin now. I may be leaving now. Salam maaf zahir n batin. Benar-benar sms - ringkas dan padat. K Jah seolah-olah sudah tahu bila beliau akan pergi. Ini mengingatkan kita cara Imam al-Ghazzali sudah maklum beliau akan meninggalkan dunia yang fana ini dan memakai kain kafannya. Masha'Allah. Kata-kata K Jah memang benar - beliau berangkat meninggalkan kita terutama ahli keluarganya yang dikasihi pada hari Sabtu. Sejak menziarahi K Jah di HUKM saya bacakan surah Yassin beberapa kali diiringi doa: Ya Allah, jika takdirnya sembuh, sembuhkkanlah K Jah dan jika takdirnya pergi menghadapiMu, mudahkanlah pemergiannya. Allah lebih menyayanginya dan mengetahui rahsia-rahsia kita. Kini saya cuma dapat menenangkan diri dan perasaan bahawa K Jah pergi dalam keadaan husnul khatimah dan kejayaan muflihun. Innalillahi wa inna ilayhi rajiun. Semuga Allah mengampunkan Allahyarhamah K Jah dan menghimpunkan ruhnya bersama golongan abrar. K Jah sudah pergi namun kita mestilah teruskan usahanya dalam bidang keilmuan dan pendidikan untuk memantapkan sains Islam dan aqidah umat. Inilah sekurang-kurangnya kita dapat lakukan sebagai mengenang jasanya yang tidak ternilai. wabillahi tawfiq walhidayat. Allahu 'alam. Abah is what I called my late father in law. He was a person with a strong personality and his presence would never go unnoticed. Through out my married life I have grown to love this man who was well reputed to not show his love and concern in the open but more in his gestures and in a diary (we only found this out after his demise). Conversations and discussions with him can be a tad difficult at times but this was mainly due to his British education backgrounds having attained his basic degree in London , post-degree in Bristol and dip-ed in Kirkby, which caused him to frequently come up with archaic colonial ideas. None the less, there are topics which I find easily agreeable, a topic which he would rave on, that is, how practical and reasonable the British education system is or was, back then. 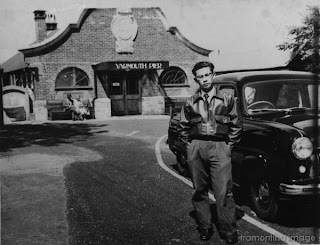 Abah had lived a long fulfilling life, just like his mother and his was a colorful one I daresay. Having a grand-father who was a warrior to the former Sultan of Pahang and a father who was a leader figure in Tembeling, Jerantut, Abah had no problem in continuing their legacy. 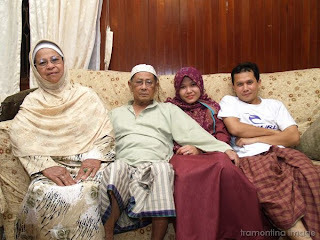 However, Abah had to endure a relative difficult childhood as his father had died young , leaving behind a young wife, whom, due to some misunderstanding with her in laws, had decided to return to Kuantan, where her parents was, with her small son. Thus began, our renowned family saga of how Abah and his mother had traveled up the Pahang river on a small sampan for days, an embittered widow and an orphan who was clueless of what awaited him in Kuantan. I know I am not the best person to write a bout Abah. I am writing bits and pieces of what he had oft-repeatedly told me. As I write I can still reminisce his voice, his gesticulations and his favorite phrase to reiterate his point: “Awak faham dok?’ or “Do you understand?’ when his British tongue got hold of him. After his heart bypass, Abah had sort of developed a coarse high pitched voice which stayed with him till his last breath. “Suara abah boleh baik tak Roza?’ “insyaAllah Abah tapi lambat sikit la’, I replied. During his final days, he phoned me to inquire about his hospital follow-up but I had difficulty in discerning his words. I knew it was exasperating for him and for me, too. 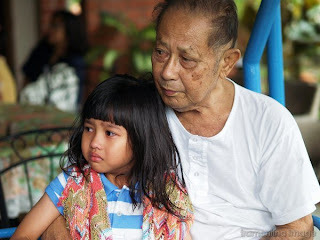 Whatever Abah lacked in bringing up his children, he squared it up on his grandchildren. He was a doting grandfather to my children, having looked after them when we were busy studying and working. Of late, he was so besotted with Hasya, hubby’s niece who lives in Kuching, that her phone-calls and home-coming would brighten his days. He waited eagerly for Hasya’s return few days ago, spent the night with her and breathed his last the next morning during his routine dialysis treatment. And I wonder if he had begged Allah swt to let him see his favorite grand daughter before he goes? The morning that he would leave us, I had gone to fetch him for his routine dialysis. Due to a recent spine fracture, he was bed-ridden and couldn’t walk. We had to carry him from the room to the car. As I was lifting his body from the bed, he had held on tight to me a moment longer than usual. Was he trying to gesture his goodbye to me? Allahu’alam. I would like to think so. Abah, forgive me for all the wrongs I have done you. May Allah swt bless your soul with His Rahmah and protect you from the fitnah of afterlife. Ameen. To all muslims, let's join in this global prayer event on Wukuf day on 16th Nov at about 6pm local time. It's also sunat to fast on that day. Awife,a mother,a daughter and I suspect,a grandmother in 7-8 yrs to come? ?A doctor who works to treat the sick but at times get frustrated as the sick at times chose not to listen...sigh..
Oh My Dear Children...... | I wish that each one of you attain the best of this world and the hereafter!